powder room / builder - cmd corp.
What was used on the upper half of the wall? I absolutely love it! Wow i thought it was mother of pearl tile too. Very nice wallpaper. wow! where is this console vanity from? 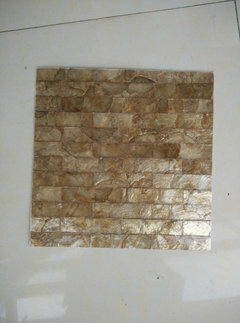 I saw this photo months ago and have been trying to find the wall paper, which I think might be mother of pearl shell. The marble on the wall is also beautiful. Where can I fnd the wall paper? Is this an onyx tile? It looks slightly pillowed on the right wall, too. Beautifully done. I believe that the wall is a Maya Romanoff wallpaper. Check their website. I love everything that they do - very unusual and exquisite designs. I love the floor and lower wall tile. What is the brand/color?
. For this project, the owner selected and purchased directly the onyx floor and wall. Where can I get this wallpaper? - Where can I get this wallpaper? where is the sink from? The granite vanity sink top was custom designed and custom manufactured. The supper legs, faucet, vanity sink drain and the under-mounted vanity sink were purchased from Sherle Wagner. All of the Sherle Wagner fixtures were gold plated. The drawings remain with the owner, and are not available for reproduction. question on sconce placement - Can u tell me if there are 2 sconces in this powder room. I have similar set up, with wall near right side of sink so there is only room on left for sconce. I'm not sure if that looks correct or if one need sconces on both sides. Thamks for your help.
. Listed under Powder rooms you will find additional photos of this space. The following link will offers you a partial view of the second sconce. Love the mirror. - Where did you find? This project was complete a few years back, which I no longer have the records of the manufacture the client purchased the mirror. The bathroom products were ordered from sherlewagner.com which you may be able to research their product line. Vanessa Brunner added this to Which Wallcovering Is Right for You? 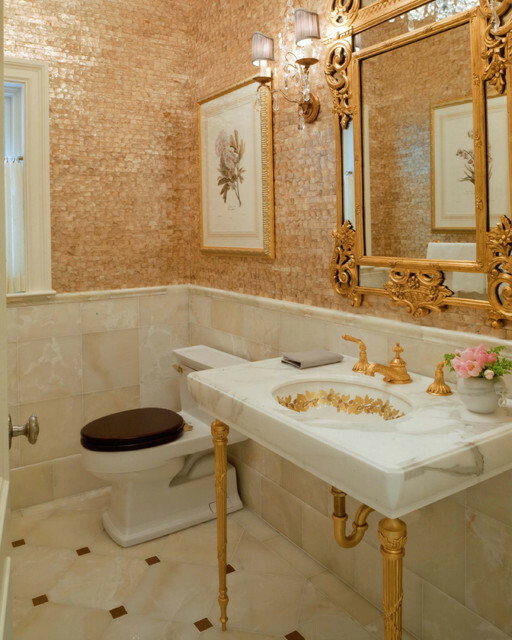 Bathrooms are a bit more difficult when it comes to wallcoverings, since anything that you apply has to be able to withstand a good amount of moisture, heat and frequent cleaning. Vinyl wallpaper is definitely a potential choice, but double check with the store or manufacturer that it can withstand the wear and tear of daily bathroom use. In this bathroom, the designer paired a shell-inspired paper-backed wallpaper with tile, allowing for easy cleaning and maintenance. 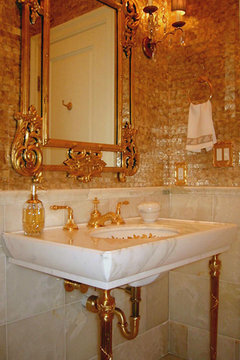 Maximize your gold by pairing it with timeless marble. Marble sinks aren’t anything new, but this one introduces an entirely new level of panache with gold hardware, detailing and exposed legs. A mirror framed in gold visually pulls the metallic accents upward.